I still have not made the video tutorials for Federal tax resolution based on my book “Don’t Mess With The IRS” that was self-published almost a year ago! 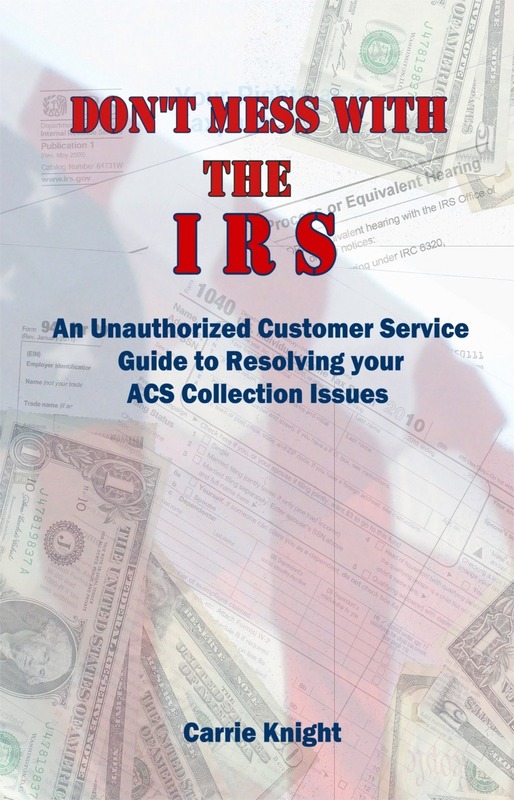 The very reason I wrote it in the first place was to help all the taxpayers that I used to work with to try and explain how the ACS Collection area works in the Internal Revenue Service. There were so many people who would call that had no idea what they were calling about. Some state they had never opened the letter that arrived, but wanted to report they received a letter from the IRS. In these calls the information needed to be pried from them. Some had no idea what manners were and the last thing you want to do with IRS problems is call them and behave rudely. You know how people say never mess with the people that serve your food? If you are a person that does not practice the Golden Rule, how about adding you don’t want to mess with the IRS, medical people who literally have your life in their hands, mechanics, pretty much everyone if you really think about it. That might be why it’s the Golden Rule. Back tax issues, have not filed returns for a while or think you do not have to file because you are self-employed, any Internal Revenue Service problem and how to resolve it will become much clearer after reading “Don’t Mess With The IRS An Unauthorized Customer Service Guide to Resolving Your ACS Collection Issues.